Abstract: The advancement of science and tech shortens the distances, from bicycle's mechanical transmission to electric scooters in order to improve mobility speed to realize green travel. The latest achievement SE3 ridable luggage is part scooter, part suitcase which will make your trip entertained. Airwheel absorbs elites and spares no effort to make Airwheel a backbone of smart transportation manufacturer. Airwheel's well-known smart luggage has started the next round with a range of new and optimized features. As we know, the main features of SR3-the first model of smart luggage include auto-follow, anti-lost alarm and intelligent obstacle avoidance and more. SE3 fully functional drag-along suitcase is different from SR3, as it is ridable. 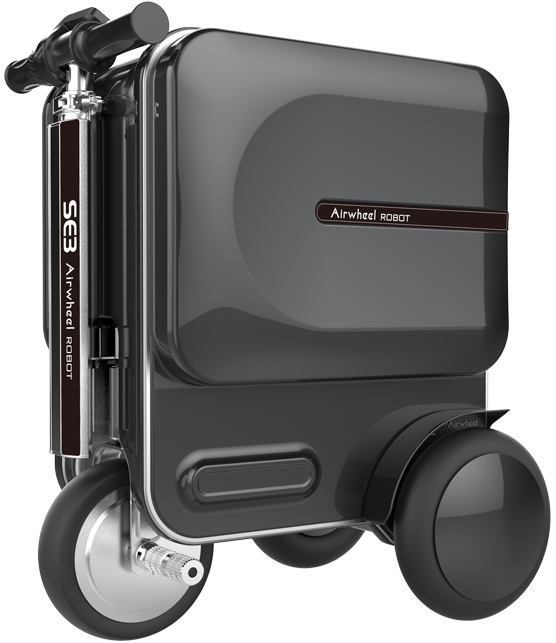 Airwheel SE3 ride on luggage for adults allows you to fly to your gate on this luggage and save significant time in airport terminals. It installs three large wheels with special treads and excellent grip performance to make it possible overcomes various road conditions while riding. Plus, the branded lithium battery is the proof of high quality and long range. It's a stress-free way of getting from A to B, making every trip an opportunity to let them burn some energy and hone their riding skills. There is plenty of room for travel essentials. And the cabin sized SE3 is perfect for stowing in your overhead compartments. The stable steering system is for safety. The aluminum alloy rod increases the strength and reduces the shake of the pull rod. The gear adjustment design adapts to different heights. What is more, user can unfold SE3 carry-on smart luggage in a jiffy thanks to the automatic retractable design and they will be ready to go. Its hidden riding levers save as much space as possible. At the same time, all the operation is realized by only one-button, with auto-expanding and free conversion between riding and dragging. 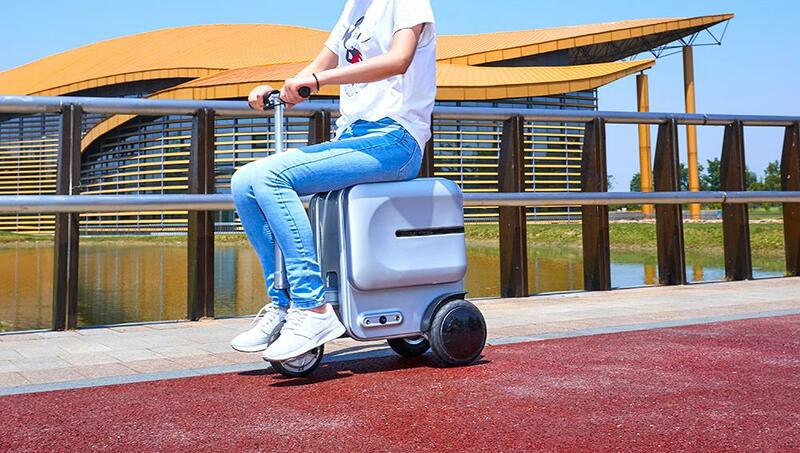 The ultimate combination of luggage and scooter, allows travelers to race to terminals in the airports and to enjoy the leisure time in park or weekend breaks. Where you off to? Vacation, weekends or business trips? Fill Airwheel SE3 smart ridable carry-on luggage full of the stuff you need and as you scoot merrily anywhere you want. Next：Airwheel H3S power chair: each and every feature designed has the customer's comfort and safety in mind.